Aesthetic treatment for noise walls for communities. Manufacturer of vibrantly colored cork tiles in unique design styles for wall, floor, or ceiling use to reduce transmission of sound, vibration and impact noise. More than 30 colors available. NETWELL NOISE CONTROL supplies soundproofing products and treatments for commercial, industrial, and residential applications. Sound absorbing foam panels and baffles. Noise blocking curtains and enclosures. Manufacturer of GREEN GLUE, a high performance visc-elastic damping compound for use in various sound and vibration isolation applications. Smart Skin designs and develops innovative solutions to control noise and vibration in surface structures, through the application of its patented technology to manage the energy flow. Award winning products, solutions and services for all aspects of Home Theaters, Plumbing, HVAC in private residences and related community noise control areas. Manufacturers of quiet power tools. Barkingdogs.net is the most comprehensive source on earth for information about chronic barking. Cityproof custom manufactures and installs interior window systems that eliminate up to 95% noise infiltration, eliminate up to 99% draft and dirt infiltration, provide maximum thermal control, and provide security and privacy. The Cityproof interior window works in conjunction with the existing exterior window. It is installed on the inside and creates a 'buffer zone' and seal between the two windows. America's leading 'green building' manufacturer, including 440 Sound Barriers. Manufacturer of Soundbreak XP Acoustically Enhanced Gypsum Board. Online source for sound isolation products (including Green Glue Noiseproofing Compound, mass loaded vinyl, resilient sound clips) with personal service and qualified advice. Your source for acoustical and soundproofing materials, articles and ideas. Honda offers a complete range of outdoor power equipment for commercial and residential use. Manufacturers of high quality, all weather outdoor and professional footwear. co/ Country Home Products, Inc.
Neuton mowers are America's #1 selling battery-powered lawn mowers and are rated the quietest rotary mowers by the Noise Pollution Clearinghouse. Manufacturer of top quality reel mowers and garden tools. Production supplier of active noise cancellation and vibration cancellation systems. A properly installed and utilized Ravelco Antitheft Device has never been defeated by car thieves in order to steal a vehicle. Over 30 years in business and over 3.5 million installations worldwide. Endorsed by numerous police departments. Recently featured on NBC television. Affordable cost. Lifetime warranty. Mobile installations -- we come to you. Global Polymer Building Products company serving the window and door industry. Solve your noise problem. Reduce noise levels 75% by adding a second window designed to stop noise. Come review our website. St. Cloud Windows is a custom manufacturer of premium quality aluminum windows and doors that integrate distinctive acousthetics and advanced performance, enabling you to create unique and memorable buildings that reflect your vision of beauty and excellence. Supress offers sound-engineered products for commercial, multi-unit, and residential structures. 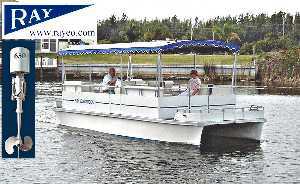 Builders of exquisitely crafted 15' and 22' quiet electric powered boats. Waterproof gear for canoeing and kayaking made in the U.S.A.
Kestrel makes light weight, water proof and easy to use pocket weather meters. Ray Electric Outboards is the largest manufacturer of primary power electric outboard boat motors in the world.